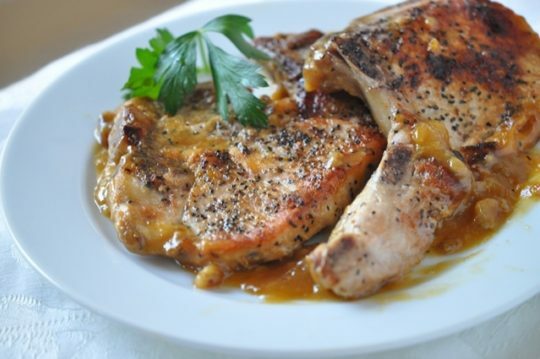 A six ingredient easy recipe for pork chops that liven up with this sensational chutney sauce, a touch of sweet and heat. This recipe is from trim&TERRIFIC Eating Well to Fight Arthritis. Season pork chops to taste. In large nonstick skillet coated with nonstick cooking spray, brown pork chops over medium high heat, 4-5 minutes per side. Remove to plate. In same pan, sprinkle with flour, and stir. Add chutney, mustard and gradually add broth. Bring to boil, lower heat, stirring, until slightly thickened. Return pork chops to pan and continue cooking until done and well heated. Terrific Tip: Mango chutney is found in a jar usually with condiments.